They have gotten to a stage in their lives where they’re just not willing to live without it. And because it’s so pervasive, it’s shocking to me that men don’t know what that one thing is that’s missing in their relationship that makes all the difference. Connection is having a deep, soulful, intimate connection with your partner. Connection is allowing yourself to be seen – even the things you don’t let others see. Open. Vulnerable. Imperfect and alive. Connection is about sharing a piece of your heart with another soul. It’s being genuinely curious about your partner, without judgement. It’s having someone by your side and someone in your corner; and you in theirs. We were created by love and connection. We were created for love and connection. And to love and connect with each other is all we’re here to do. If we were meant to do this thing called life alone, we’d be here by ourselves. And when we’re not connected to one another, life is a pretty lonely place. 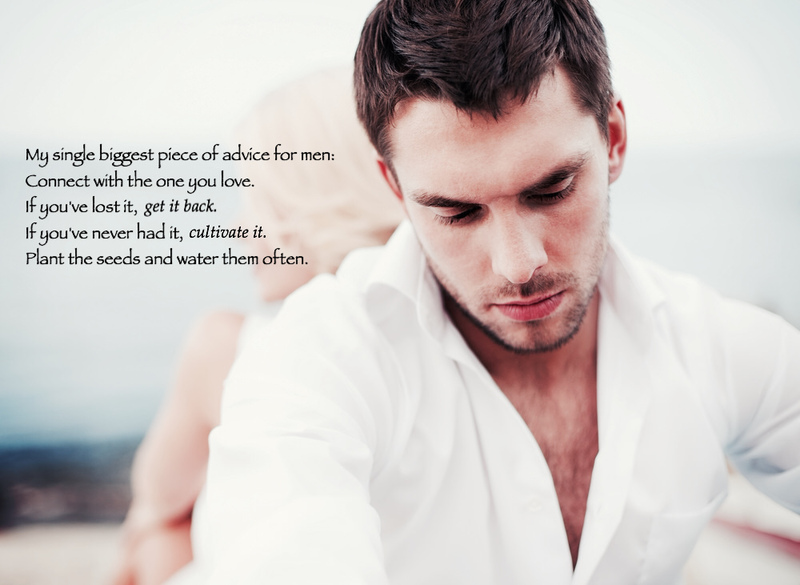 So if I had only one piece of advice for men it would be to embrace connection with your beloved. If you’ve lost it, get it back. If you’ve never had it, cultivate it. Plant the seeds. Water them often. If you are one of the few men who have already figured this out: BRAVO. It feels pretty good, doesn’t it? P.S. Feel free to share with a man in your life that needs this.